Thirty or so years ago, a young woman in a village in Cornwall became pregnant, and before they could marry, her boyfriend was killed in a fishing accident. Her mother, unexpectedly much harsher than Alice had expected, sent her to a convent to have her baby--one of the now-notorious Magdalene laundries. From this experience, Alice emerged without her baby, but with an absolute determination to find and reclaim him--and an unforgiving anger toward her own mother. A year ago, Dovie Larkin's fiancé, William Prescott, committed suicide two weeks before their wedding. He left no note, no hint of why he did it, and Dovie has not recovered from the blow. Today, while eating lunch next to William's grave, she sees an old woman leaving a letter on a nearby grave--the improbably grand grave of Alice Tandy, former maid to the Tate family, substantial donors to to the museum where Dovie is director of fundraising. The old woman is Dora Tandy, Alice's mother, who came to America seeking her daughter and, if at all possible, her grandson. 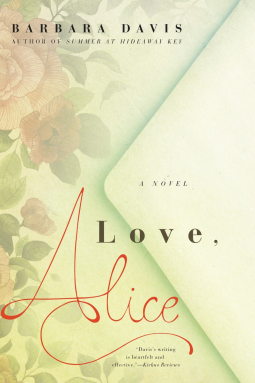 Dovie, seeking a distraction from her own grief and confusion, first steals the letter from the grave, and later gets hold of letters Alice wrote--and never mailed--over many years, that were left at the gravesite and then taken to the lost and found office. Compassion for the grief of Alice's mother, plus the need for distraction, draws her into investigating Alice's mystery. What happened to her son? Did she ever find him? Why did the Tates give her the grand monument when she died? What Dovie doesn't expect is that reading the letters, trying to find ways to talk to Gemma Tate, sitting every workday lunchtime by William's grave, and working on the museum's seasonal fundraising gala will all combine to bring her answers not only to Alice's mystery but her own: why William killed himself, two weeks before their wedding. In the course of this, Dovie, Dora, Gemma Tate, her son Austin, and an unexpected person from William's past all have to work through feelings of grief they haven't even been able to admit to themselves. This could have been maudlin. It isn't. I found it absorbing and emotionally satisfying. Even the least likable characters prove to have their reasons and their own viewpoint, without being whitewashed into shallow, feel-good, "all around nice."